Items on our menus may contain allergens from the list below. 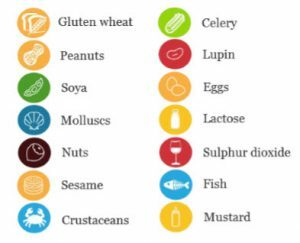 If you need to know if allergens are contained in any of our products, please don't hesitate to contact us and discuss any allergies or intolerance to any food items. Top Nosh provided a wonderful birthday buffet for my 40th birthday celebrations. Thank you for such lovely food and friendly people. Thank you for providing such a wonderful buffet for our anniversary. The food was delicious and many people commented on the quality and the presentation. We were absolutely delighted with both food and service received from yourselves, thanks again and we will definitely recommend you to others. © Copyright 2018 Top Nosh Catering Ltd. All rights reserved.